In his trademark style, electronics-themed storyteller John T. Frye used his Mac's Service Shop venue to introduce readers to another new development in the medical electronics field - the "ultrasonoscope." It was the forerunner to modern sonogram machines. Relatively recent advances in solid state electronics and signal processing techniques - albeit mostly analog in nature - made design and construction of compact devices practical and affordable by medical facilities. Unlike today where many doctor's offices have their own x-ray and sonogram machines, it was still mostly hospitals that owned them in the late 1960s when this piece was written. Mac McGregor schools his right-hand-man Barney on the benefits of expanding their knowledge universe to include some of the newfangled medical devices in order to help assure future business. 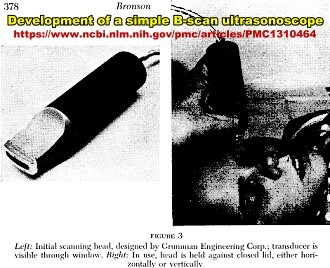 I found (and link to) a paper describing one of the first ultrasonoscopes manufactured by Grumman Engineering. Servicing medical electronic equipment can be a rewarding job for responsible, knowledgeable, well-equipped technicians. It was a jewel of an October morning - sparkling with dew, flooded with sunshine, and tinged with just a trace of that too-good-to-last gentle melancholy that always is a part of true beauty. Barney reluctantly stepped out of the glorious autumn morning into the service shop, but his eyes widened as he saw Mac, his employer, seated cross-legged on the service bench reading a loose-leaf brown manual. "Hey," the youth exclaimed, "I didn't know your rheumatic old legs would fold up like that. How come you're sitting on the bench?" "Because Matilda beat me down here this morning and painted both the bench stools," Mac growled, nodding to where the bright green stools rested on top of the "intermittent-cooker" bench. "They didn't really need it. I painted them myself only ten or twelve years ago." "When you encounter a determined woman with a paintbrush, you may as well give in gracefully," Barney advised. "Even I, a bachelor, know that much. What are you reading?" "A service manual on a piece of medical diagnostic equipment called an 'UltraSonoscope.' Last week I had a phone call from the manufacturer on the East Coast who said one of these units was being sold to the local hospital. A couple of doctors in the lab here had suggested we be contacted to see if we would undertake service of the instrument in case of failure." "You see it's hardly practical for a manufacturer of medical electronic equipment to maintain service stations manned by factory-trained personnel in all parts of the country. Not enough units are sold to warrant that. Neither is it feasible to send a serviceman out from the factory every time trouble is reported with one of the units, especially when most of these difficulties are simply 'cockpit troubles' caused by improper adjustment or operation. A more satisfactory arrangement, according to the man who called me, is to locate a well-equipped service technician in the area who is willing to undertake maintenance of the unit." "Yeah, but can a radio and TV service technician successfully undertake a job like that?" Barney questioned. "It seems to me be should have both a medical and electronic background for that kind of work." "Essentially it's a precision short-range sonar system using sharply beamed pulses of ultrasonic sound to probe tissue by observing on a CR tube echoes returned from interfaces in the tissue. The transducer used to send the pulses into the tissue also is used to pick up the returning echoes and feed them into an amplifier for display on the scope tube. "Since sound waves travel through tissue at a velocity of about 150,000 cm/s, the horizontal sweep of the scope can be calibrated in terms of the depth of tissue through which the echo is returned. A precision marker generator and dividers in the instrument produce a calibrated base-line display marked off in centimeters and fractions of tissue penetration. If the instrument is adjusted so that the 'main bang' pip indicating the surface of the body is on a centimeter mark at the left of the screen, the indicated distance to the right of this mark that an echo pip appears is a measure of the depth of tissue through which the echo is returning. "This is with the instrument operating in the 'A-Scan' mode in which the horizontal axis represents time translated into tissue penetration and the vertical axis represents intensity of the echo. In the 'B-Scan' mode, the display is effectively turned through 90 degrees so that the former vertical pips come out towards the observer. In other words, the beam is intensity modulated by the echo signals feeding the receiver. Now if the location of the initial pulse on the face of the tube can be directly correlated with the movement of the transducer over the body and if a photograph of the resulting scanned display be made, the result is a 'tomogram.' a kind of cross-sectional view of the tissue beneath the scanning transducer. "In another application, called 'echocardiography,' the transducer is applied over a beating heart and the dimmed horizontal trace. intensity modulated by echoes returning from moving tissues of the heart, is swept slowly upwards from the bottom of the CR tube while a camera photographs the resulting scanned display. Movement of tissue surfaces toward and away from the transducer - say the surfaces of the leaves of the mitral valve - cause the echoes returned from this tissue to move respectively left and right on the base line. When the base line is scanned upwards at a uniform velocity, this lateral shift in the echo signal traces out a continuous sawtooth-like display. If an EKG trace is simultaneously displayed on the left side of the screen, the position of the parts of the mitral valve - or any other moving parts of the heart, for that matter - can be correlated with any particular portion of the heartbeat cycle." "Hold on," Barney interrupted, "Let's see if I'm with you so far, doctor. Apparently this UltraSonoscope consists essentially of a precision laboratory-type scope, a marker generator that's probably crystal-controlled, an ultrasonic pulser, and a specialized vertical amplifier for displaying the echoes. That much would take care of the A-Scan display. The slow-sweep vertical scan used in B-Scan echocardiography would require a vertical sweep circuit. And to produce that tomogram you were talking about there would have to be some device that would cause the movement of the transducer to produce spot-positioning voltages for the CR tube. How am I doing?" "Not bad, but of course things are not quite that simple. For example, the UltraSonoscope has an adjustable Sensitivity Depth Compensation circuit to compensate automatically for the attenuation of pulse signal echoes as they are returned from deeper and deeper tissues. This is actually a time-variable gain control keyed to the horizontal sweep so that the gain of the vertical amplifier increases as the trace moves to the right, insuring that the strength of the echo returned will be a function of the interface itself and will not be greatly influenced by how far this interface lies beneath the surface of the body. There are other tricky circuits involved in both the basic instrument and the many accessory modules available for it. 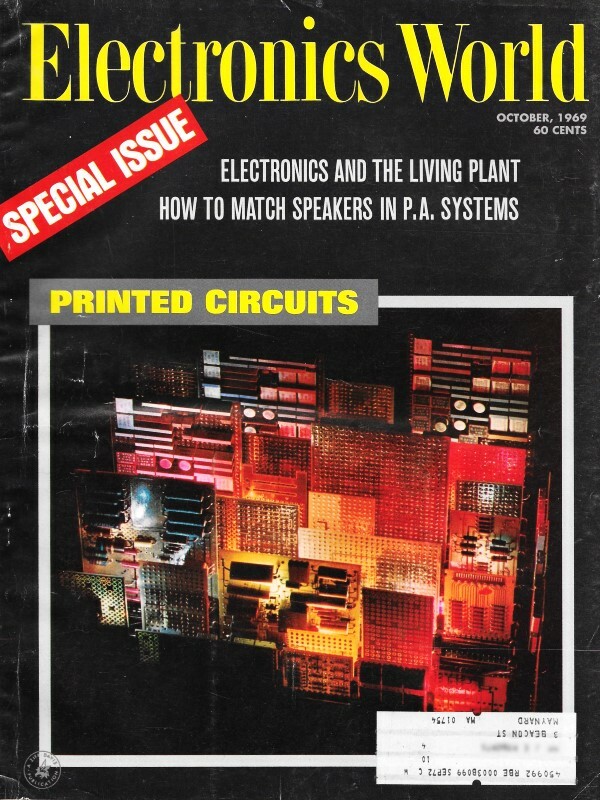 Still and all, the circuitry consists of sophisticated applications of fundamental electronic concepts that should be understood by any good TV service technician." "You did, then, agree to take on the maintenance job?" "Yes, after a little arm twisting. The manufacturer agreed to furnish complete service data on the instrument plus consultation privileges. In other words, if something goes wrong with the instrument that cannot be easily and quickly located from directions - contained in this service manual, I can pick up the telephone and call the company and talk with their engineer. His experience and familiarity with the instrument plus my observation of symptoms and carrying out of suggested tests will, hopefully, get the thing going again in jig time." "I'm still surprised you let him talk you into it. Surely the comparatively small amount of loot involved in servicing one instrument wasn't a factor." "No, but there are other things to consider. In the first place this is an opportunity for us to expand our knowledge of electronic applications. Secondly, it may open the door to a great deal more of this kind of specialized service that could become quite lucrative. We both know medical electronics is just starting to take off, and this could be an opportunity for us to get in on the ground floor. Finally, someone must service medical electronic equipment if it is to take the place it should in the prevention and curing of disease. If we, who can do it, won't, the widespread application of such equipment will lag far behind its true potential; and people will suffer and die needlessly as a result." "You sound as though you're getting ready to plunge into medical electronics servicing with both feet." "Far from it! I'm just dipping a cautious toe into the water. Candidly, this kind of service work is not for every TV technician, and anyone considering it should do a lot of soul searching before he tries it. "You must be constantly - safety-minded in working on this equipment. This service manual has several paragraphs on just that subject as applied to the UltraSonoscope and its use. Every effort has been made to prevent leakage and to insure good grounding of the instrument and all its attachments, but the maintenance technician must take every care to see to it that these precautions continue in effect." "But in spite of all these drawbacks, you are still going to venture into this kind of service." "Yes, for the reasons I mentioned and because doing this kind of service may sharpen our TV service techniques. Working as we do on the same basic kind of equipment day after day, there is an increasing tendency for us to depend more and more on well-learned experience and habit and to divorce the higher thought processes from what we are doing. As lots of guys boast, 'I can service these things in my sleep.' Servicing unfamiliar equipment will force us to think hard about every symptom we perceive and every test we make. If the doctors are going to be able to depend on the UltraSonoscope to diagnose faulty hearts, locate brain tumors or objects in the eye, determine the size and shape of gall stones, or measure the size of an unborn infant's head, we are going to have to be on our toes every minute we are servicing the instrument. "Hey," Mac broke off, "why are you staring at your shop coat so hard? Something on it?" "No, but I was just wondering if maybe we shouldn't trade these green jobs in for some smart-looking white laboratory smocks more in keeping with our new career," Barney said with a grin. "But come on, Grandpa; unkink your legs and crawl down off that bench while you still can, It makes me hurt just to look at you!"